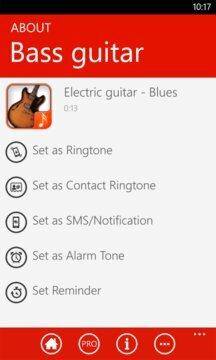 “Musical Instruments Sounds” free Windows Phone app is here to make you enjoy the melodies of your favorite music instruments. Set your favorite musical instrument sound as a ringtone, sms sound or an alarm. Use them as an educational tool that helps kids and other people learn more about music instruments Free and music in general. You can play games all day to guess the name of the instruments when you hear the melody. There are many types of instruments you can find in this app. One of the most popular kinds of instruments is keyboard instruments with its representative piano. The other important instrument, especially in some cultures is accordion, while organ is usually connected to religion. Here is the list of percussion instruments such as drums, tambourine, triangle, and gong. In addition to that, there are some instruments that are specific for some part of world such as maracas, marimba, xylophone or cuica. If you prefer string instruments you can find the wonderful melodies played by the classical guitar, violin, viola, cello, contrabass or harp. Beside these ordinary instruments, there are some African music instruments such as djembe, dgeridoo - developed by indigenous Australians, ukulele – a Hawaiian guitar, sarangi – one of string Indian musical instruments and many other exotic instruments. Musical Instruments Sounds has been tested on the following phones (Windows Phone 8, Windows Phone 8.1): HTC 8S, HTC One M8, Nokia Lumia 520, Nokia Lumia 720, Nokia Lumia 1020, Samsung ATIV S and Huawei Ascend W1. Compatible with Verizon, AT&T and all other providers. 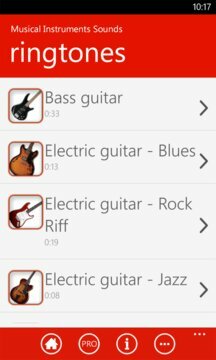 Sound clips used in Musical Instruments Sounds Windows app are under public domain license and/or Creative Commons’ license.